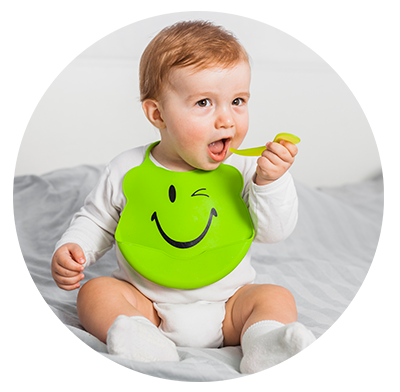 Your toddler is learning to eat more solid foods and is becoming more active and independent. This is a time of exploration and discovery that sometimes doesn’t include being adventurous with food. You may even notice that your toddler refuses some of the foods he or she loved as an infant. To make mealtime a bit easier—and healthier—have a few tricks up your sleeve. You may find that your child isn’t a picky eater, but may just take a bit more time to learn to enjoy different tastes and textures. When you offer your toddler a variety of shapes, colors, textures, and tastes at mealtime it not only keeps them interested, but gives them a more nutritionally balanced day. Try something crunchy, like whole grain crackers with something sweet like banana slices. Then add something with protein like cubed chicken or lean meat (cut into small pieces to avoid choking) and a bit of dairy like few pieces of string cheese or a cup of whole milk. You could serve salad as finger food with leafy greens without dressing, along with cut-up grapes or orange slices. Use child-sized plates, cups, and utensils that fit their little hands and appetites. Then, pair unfamiliar food with a choice they already know and like to help them broaden their palate and enjoy more challenging foods. You don’t need to stick with the things you view as typical kid-friendly foods, but you can help them enjoy a bigger variety by serving them the same foods you are eating, just in smaller portions. You don’t need to force your child to eat something he or she doesn’t like, but keep offering a variety of foods. The key is to keep exposing them to new tastes, colors, and textures. And, your example is critical. When your child sees you eating and enjoying veggies, they are much more likely to eat and enjoy veggies too. Sometimes your child just needs a model. When they see how much you like something they will be much more likely to try it themselves. With your older toddler, it can be fun to take them to the grocery store with you and let them pick out a new fruit or veggie to try. Often when your child helped pick out a new food they will be more excited and willing to try it. Who knows? They may pick out something new to you too! Toddlers are enjoying their new independence. They like food they can hold themselves, like whole green beans, steamed carrot strips, or cubes of whole-grain bread. You can try things with different textures like avocado chunks, scrambled eggs, or even tofu. Noodles and pasta with different shapes and sizes are fun, and you can try cutting veggies in different shapes as well. It’s best to avoid foods that are easy to choke on. Be careful with sticky foods like peanut butter and marshmallows, and watch out for small, hard foods like nuts, seeds, popcorn, raw carrots, and raisins. Slippery foods can also be troublesome, so avoid serving your child things like whole grapes and large pieces of meat or hot dogs. Keeping mealtime more structured can help to regulate your child’s appetite and attitude. Serve most meals and snacks in a designated area, like the kitchen table, and at about the same times each day. Avoid falling into the short-order-cook habit of giving your child requested items all day long. Toddlers’ tummies are only about the size of their little fist and fill up easily. A common mistake is to allow children to drink milk and juice throughout the day or snack between meals, decreasing appetite and intake at main meals. As your child grows, so will their love for different foods. Be patient and keep introducing new, healthy alternatives to keep them on track and happy. Annie Buck is an Occupational Therapist with Kids Who Count. 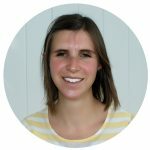 She specializes in helping children with feeding and sensory delays. She lives in a houseful of boys. She and her husband have four sons, from 8-months-old to 7-years-old. Things are always loud at home with fun that usually involves someone wrestling someone else.